For a limited time a ‘Mambacolor’ option is available to customize on the Nike Kobe X Elite Low model. The new colorway is a play on the popular ‘Multicolor’ Flyknit option as well as the limited ‘Mambacurial’ Flyknit version that released after Kobe Bryant passed Jordan on the all-time scoring list. This version uses primarily purple strands amongst the multiple colors on the upper whereas the other versions mentioned above featured more green and orange. The pattern will be different on every pair though, so colors may vary. Unlike the previous ‘Multicolor’ Kobe X iD, this version features full use of the upper for the rainbow knitting, whereas the ‘Multicolor’ version featured a half monotone Flyknit on the medial side of the shoe. 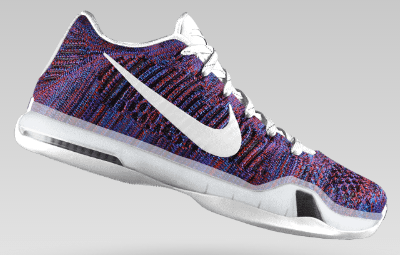 You can customize your own Nike Kobe X Elite Low ‘Mambacolor’ for $245 HERE. Enough with the Kobe x, stop trying to squeeze the dollars from the customers pockets, its been a year now give or take, release the xi damn it!…and retire this. At least this is way better than the half-hearted Kobe X Multicolor release. I guess all I have to do is to go over to Niketalk in order to see who the idiot may be, the one who’ll pay two hundred forty five dollars for this shoe.